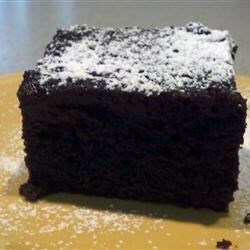 "This incredibly moist chocolate cake is simply delicious. and simple to make too. Serve warm, topped with vanilla ice cream." Spray crock of a large slow cooker with cooking spray. In a medium bowl, whisk the sugar, flour, cocoa, baking soda, baking powder and salt. In a separate small bowl, whisk together the eggs, milk, oil and vanilla until well combined. Whisk in the boiling water. Pour the wet ingredients into the dry and mix well. Pour the cake batter into the prepared slow cooker. Set slow cooker to "Low". Cook until cake has no wet spots on top and has pulled away from the sides of the crock, about 3 hours. Turn off slow cooker and allow cake to rest for 30 minutes before serving. Bake a cake in the slow cooker? You bet!